HOW TO MAKE IT: How to experiment. I'll be using the next few weeks to experiment with my yoga. My favourite Dubai yogini @Jogini_ is off to India to practice Ashtanga with the prestigious Mysore yogis (follow her blog!). Sending her so much love, light and safe travels today and hoping she doesnt get attacked on her way to morning yoga lol. *knockonwood. 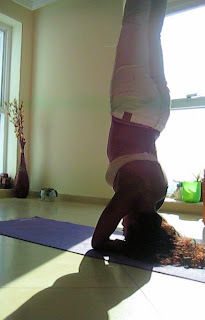 I've been working on my headstands at home, and I'm always up and balanced in a few breaths. But omg, at the end of an ashtanga practice - I don't have enough banda to get my bum off the wall! Jo - when you get back, I WILL do this.